Important principal of the Inheritence is that an instance of the Subclass can be used in all the contexts where the Superclass can be used. This is possible because the Subclass contains all the attributes of the Superclass, because Subclass has been inhertied from the Super. When we assign the instance of the Subclass back to the instance of the Superclass, than it is called the “Narrow Casting”, because we are switching from a “More Specific view of an object” to “less specific view”. For example: we have a class a global class for ANIMAL. Now, we have inherited more specific class as LION from the ANIMAL. Since LION will have all the attributes from the ANIMAL, we can always refer back to ANIMAL with the reference of the LION. When this Narrow casting is used? An application which is interested in the details of the LION, but don’t want to know about them. An application only needs to work with the ANIMAL class. In order to allow the application to access the attributes of the LION we have to do a narrow cast and assign it back to the ANIMAL, which is visible from an application. Lets check out the UML of the Demo. In words: LCL_ANIMAL class has a method HUNGRY( ). LCL_LION is inherited from the LCL_ANIMAL. Program is using the LCL_LION to access the instance. Lets checkout the code lines. 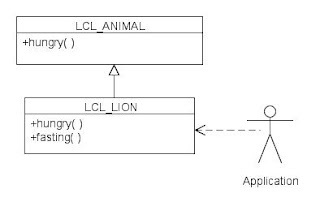 CLASS lcl_lion DEFINITION INHERITING FROM lcl_animal. WRITE: / 'An animal is hungry'. 'Run as fast as you can..!'. WRITE: / 'Stop running. Lion is on Fasting today.'. lo_lion   TYPE REF TO lcl_lion. WRITE: / 'Animal - without NARROW casting'. WRITE: / 'Animal -  NARROW casting from LION'. Thanky u for the explanation! I saw that the terms “up cast”, “down cast”, “narrowing cast” and “widening cast” often get mixed up. 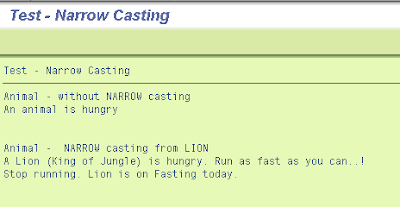 According to the official ABAP documentation published by SAP e.g., a narrowing cast and a down cast are the same. They would also consider your example as an up cast, but as a widening cast, not a narrowing one. Also called Up Cast. Assignment between reference variables, where the static type of the target variables is more general than or the same as the static type of the source variables. See also Widening Cast. Variables of the type “reference to superclass” can also refer to subclass instances at runtime. described as a narrowing cast, because you are switching from a view with more detail to a view with less detail. The description “up-cast” is also used. The F1 help of our AS ABAP 6.20 says you need ?= only for widening casts, while the F1 help of our AS ABAP 7.0 says you need ?= only for narrowing casts. The BC404 course already existed for release 4.6C, so it probably still contains SAP’s superseded casting definition, too. Hello Christian, I guess in older version SAP was using (only) Super Class to point out the super class. But from the release 711, they are referring it as the ROOT class. Thanks Mr. Horst Keller for the link. It ends the speculations! why should we do narrow casting or wide casting ? if you instantiate the subclass. You can access the methods of both sub class and super class. Then, why we need to assign the subclass instance to the super class. Please any body help me regarding this. "why should we do narrow casting or wide casting ? if you instantiate the subclass. You can access the methods of both sub class and super class. Then, why we need to assign the subclass instance to the super class. Please any body help me regarding this." To design good and robust solutions, we should use the abstract class/interface in the client(caller) rather than the concrete class. So, at time you use the Abstract class (super class) to define the object reference and at run time, you should decide which object to use. This object at runtime would be the instance of the subclass. In other words, caller doesn't know the exact class until runtime. In the above example the methods for class lcl_lion can be called using the reference lo_lion directly, I mean using reference of class lcl_lion we can use all components of that class where as after narrowimg cast we ca only use inherited components, then what is the benefit of casting and using reference of super class?